A thin corrugated steel joint with pressed concentric grooves 6mm wide. Two adjacent grooves on opposite surfaces are filled with beads of Supagraf® Tape either standard or high purity grades. When compressed between flanges, the metal corrugations provide a sealing capability that is enhanced by the graphite beads. • Thinner than a spiral wound gasket and can usually be fitted in place of sheet jointing gaskets in a pipe run. • Often easier to install than a sheet graphite gasket – self locating. • When supplied with tapered-slot legs, this gasket can be used on a variety of flanges with differing bolt diameters and pitch circles. PTFE is available for aggressive chemical conditions. Restricted service capabilities apply – please contact our technical services team for assistance. Multiflange configuration: 0.5 inch to 12 inch Class 150–2500. 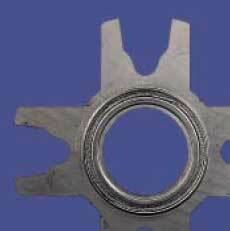 Individual flange configuration: 0.5 inch to 24 inch Class 150–2500. Other sizes on application.